Allow enough time for the dough to rise when you make this recipe. Combine yeast, water and sugar in small bowl and stir until yeast dissolves; let the mixture sit for about 5 minutes. Add olive oil to the mixture. Mix 1 cup of water with salt in a large bowl and add yeast mixture to it. Stir the dough until batter becomes thick. Add additional flour until dough becomes stiff. Place ball of dough onto a floured flat surface and knead it. Add small amounts of flour while kneading the dough until you've reached about 2 cups of total flour used. Cover the dough and let it rise until it's doubled in volume (about an hour). Stretch dough into a large rectangle shape. Top dough with basil, garlic salt, pepperoni, and cheeses. Roll dough plus filling up into a log shape and cut it into 1-inch slices. 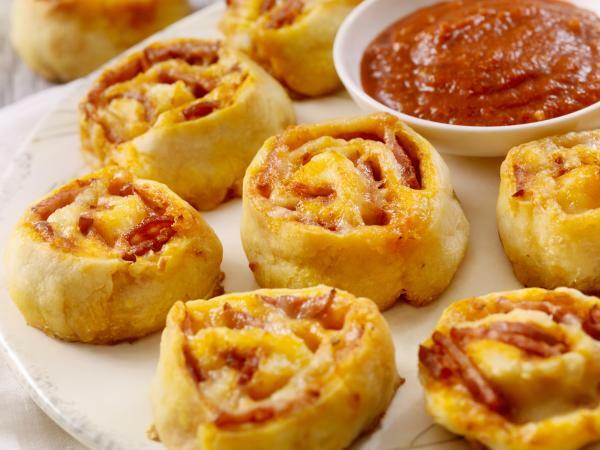 Place pizza rolls onto lightly greased baking sheets. Bake the rolls for about 10 minutes, or until browned. Try one of these substitutions and variations to make this recipe your new favorite. Instead of making your own pizza dough from scratch, use one can of premade store-bought pizza dough. Use sausage, ground beef, or Canadian bacon instead of pepperoni. Add veggies, such as mushrooms, onions, green peppers, or olives, to your rolls before baking. Place 1/2 cup of pesto sauce or pizza sauce on top of the dough before you add toppings to it and roll it up.